The most important considerations in the hand feeding process are the frequency and volume of feeding. 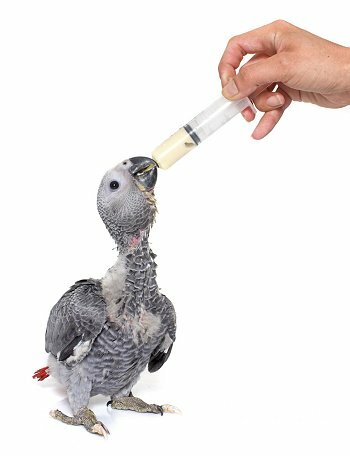 Baby birds grow at an extraordinarily rapid rate and this growth requires a great deal of food to meet the nutritional needs of the bird. 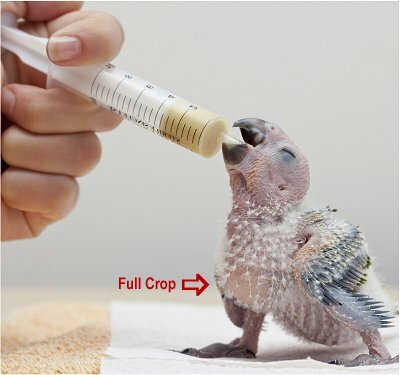 However, the crop of a young bird holds a limited amount of food, so it must be filled frequently. As the bird gets older, the capacity of the crop increases, and the number of daily feedings will be reduced. The volume to be fed is base upon a combination of observation and judgement. Nature designed a rather unique feature into the digestive system of birds-a widening of the oesophagus at the lower pan of the neck This widening acts as a compartment to hold a quantity of food, and is named the crop. The volume of food given is of critical importance. overfilling of the crop could lead to backflow up the oesophagus, into the throat, and down the windpipe, which could cause death. Under-filling the crop might result in starvation. For babies previously fed another hand-feeding preparation, a minimum of 24 to 48 hours is recommended for the dietary changes. During this period both products should be prepared (as directed) and mixed together, with the Lafeber's Instant Nutri-Start Formula slowly being increased in proportion until the previous diet has been eliminated. This diet contains no less than 8% fat, there is no need to add peanut butter to increase energy. Unnecessarily cooking this formula may require adding more water to achieve the desired consistency, consequently reducing the concentration of this diet. A small cardboard box approximately 12" x12"xl2" or a small fish aquarium with layers of paper towels over a one inch padding of cloth towelling on the bottom will serve as an incubator and holding area while the babies are young. A heating pad is placed under 1/2 of the box or aquarium. A towel is placed over the top. Either the heating pad setting or the amount of the top that is covered by the towel may be adjusted to provide a constant 85-90' for non-feathered birds. The temperature is gradually reduced as they become feathered and mature. It is recommended to observe the babies carefully to determine their comfort level. A cold baby will shiver and a baby that is too hot will not sleep well and will breathe heavily through an open mouth. A bottle or tin filled with water and holes punched in the lid to allow for evaporation will help to provide humidity.